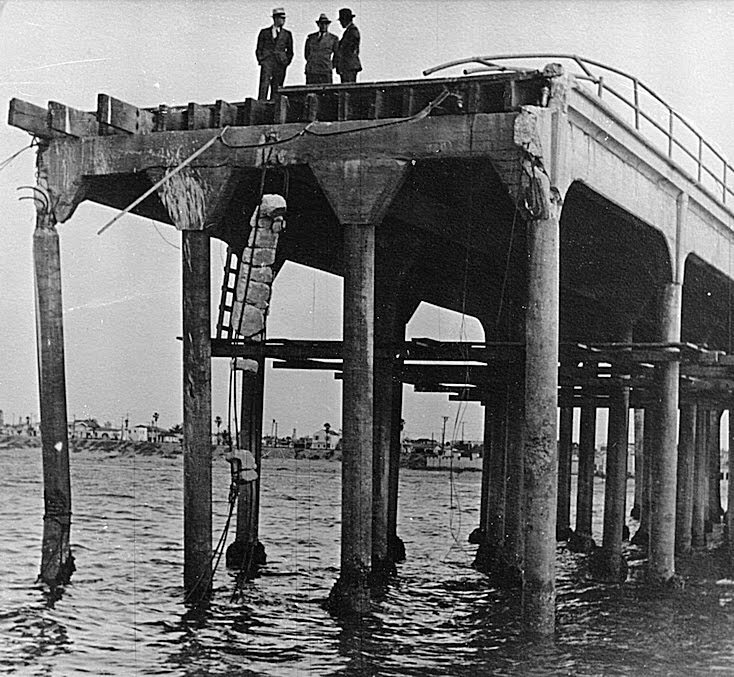 After much work, the pier was restored in 1940. But the new building at its end was soon snapped up by the Navy as a lookout post for enemy submarines. After the war, another restaurant moved in. In 1977, Johnson's Yogurts production manager John Gustafson left his executive position for a life of sunshine and sea breezes as the restaurant's new owner. He named it The End Cafe. The business was popular, and so was John. He became an unofficial goodwill ambassador for Huntington Beach. Meanwhile, his wife Alice Gustafson owned and operated Alice's Breakfast in the Park Cafe over at Central Park. 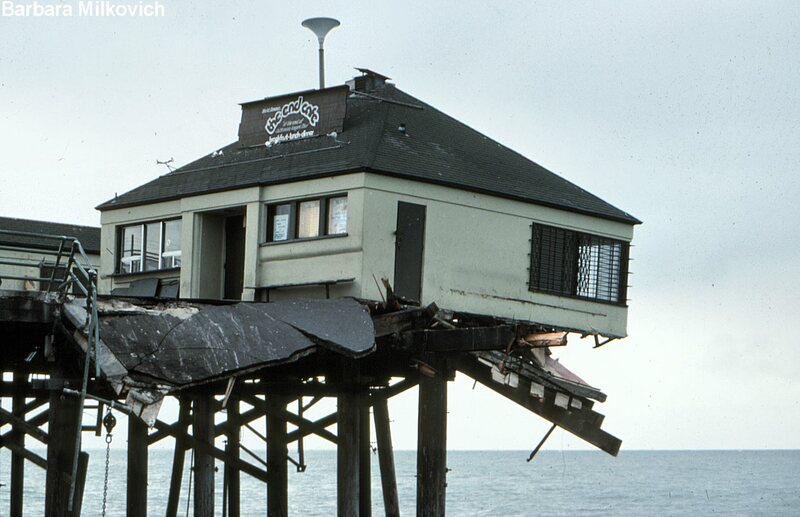 In 1983, a large storm badly damaged the pier and The End Cafe. The photo below was taken shortly after the storm at the spot where the counter once stood. Undeterred, Gustafson purchased Maxie's Pizza in the old Pavalon at the base of the pier. That held him over until October 1985 when, just a month after the repaired pier reopened, he opened a two-story The End Cafe in its old location. Soon, business was hopping again. Then in January 1988, it happened again. A violent storm rose up. 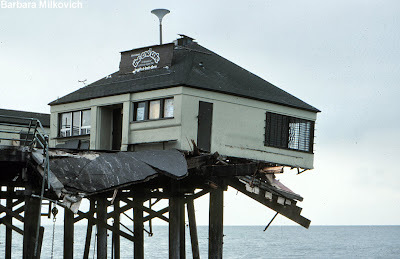 Powerful swells hitting the bottom of the pier dislodged the two-story cafe and slid it into the ocean. A Register article quoted witnesses who saw The End Cafe floating out to sea, "like a houseboat." Before the storm was over, 250 feet of the pier were gone. Later that year, the entire pier was closed and declared structurally unsafe. After losing his livelihood and investment the second time, and with no insurance on his business, Gustafson said, "I was a little numb for awhile but then I got my second wind. We lost it twice, but the third time's a charm." With the pier closed indefinitely, he continued to run Maxie's Pizza. Meanwhile several of the cafe's former employees started a citizens group to raise money to build a new pier. They had moved on to other jobs, but wanted to make sure their friend got his business back. Sadly, eternal optimist John Gustafson died of lung cancer in 1989 at age 59. From his deathbed, he dictated his thoughts to Alice on how the pier could be rebuilt, better than ever. And indeed, in 1992 it was rebuilt, taller and stronger,... But with a Ruby's Diner at the end. are there any photographs of the second The End, the two story one? I would love to see it gain. are there any other photos of the 1988 storm. of the waves? I have a unique, though perhaps a bit foolish experience on the day the last End Café fell into the surf. A buddy of mine was working at a frozen yogurt joint on Main Street close to the entrance to the pier (might have been a Heidi's Yogurt). We were punk high school kids at the time that had somehow got our hands on a bottle of liquor. After mixing frozen yogurt and liquor for a bit, checking out the huge waves crashing over the pier seemed like a fun thing to do. 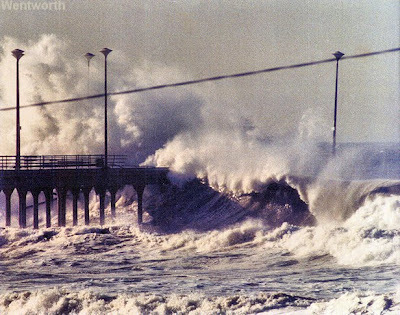 So we stumbled down the pier as the wave crash hard into it – form both sides! Funny that I don’t remember being too alarmed at the people running past us back towards the short. I suspect our destination was the End Café but I can’t be sure. Anyway, just as we were in reach of the café, the damn thing fell backwards into the drink. We finally realized the danger and run back to shore laughing... I often wonder just how I managed to survive my youth. I remember many storms at the pier, the one in the sixties the pier survived and stood strong. 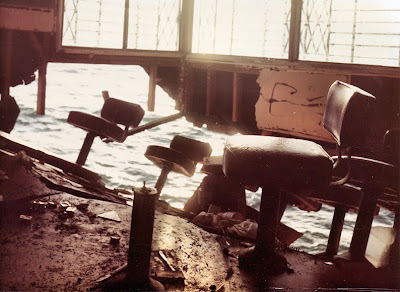 I was sad to here of the destruction I loved that diner on the end the fishing boats coming in it was all so cool. I surfed the pier many years and have so many memories. The new pier just dosn't ring my bell althugh it is nice. Two of my friends and I surfed that day. Surreal feel to be eye level with the pier. Crazy day, we didn't stay out long. 3 waves was enough. I watched it break and float toward Newport. I LOVE H.B. so much I'm gonna surf it after I'm dead, Don't ask me how But I'm gonna!!! Architectural salvage material available NOW!